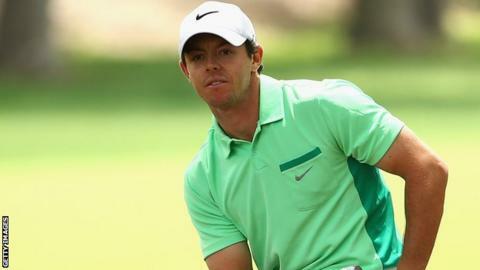 Rory McIlroy squeezed into the weekend action at the Wells Fargo Championship in North Carolina after a disappointing four-over 76 on Friday. McIlroy was only three behind first-round leader Angel Cabrera after his opening three-under 69 on Thursday. However, the world number 11 is now 10 behind Cabrera and other joint-leader Martin Flores after a round which included successive double bogeys. Darren Clarke and Padraig Harrington exited on four over and six over. Clarke's 72 kept him on his overnight position of four over and was three too many to survive. Harrington's miserable form in 2014 continued as a 78 left him on six over following his opening 72. McIlroy was fighting a rearguard action to survive into the weekend after suffering double bogeys at both the third and fourth holes. Those four dropped shots sent him tumbling down the leaderboard to two over and he had to produce a steady level-par back nine of one birdie and a bogey to survive into the weekend on the exact cut mark of one over. Northern Irishman McIlroy claimed his first PGA Tour victory in the event in 2010. Cabrera and American Flores are a shot ahead of England's US Open champion Justin Rose who shot a 67 on Friday.